We recommend checking out our discussion threads on the Pelco NSM5200 Network Storage Manager NSM520036EU, which address similar problems with connecting and setting up Network Video Recorders (NVRs) Pelco. The user manual for the Pelco NSM5200 Network Storage Manager NSM520036EU provides necessary instructions for the proper use of the product Surveillance - Surveillance Video - Network Video Recorders (NVRs). The 36TB Pelco NSM5200 Network Storage Manager is designed to meet the demanding needs of physical security and surveillance applications. Capable of offering a throughput of 250 Mbps along with high performance, this Network Storage Manager eliminates common choke points and increases operational efficiency. A powerful Linux operating system with periodic defragmentation of the database ensures smooth operations. It keeps recording critical data even if a catastrophic failure occurs, thanks to the pooled storage management that automatically distributes the load and active-active failover for uninterrupted recording. In case a user-defined critical event occurs, the NSM5200 Manager will send notifications of potential or actual issues to specific users. The frame rate of aged video is lowered over time in network storage managers to free up storage capacity. Now with EnduraStor storage optimization technology, you can stipulate the priority level of an alarm or event video to retain the full frame rate of significant videos clips. Supporting RAID 6 storage configuration, the NSM5200 ensures reliable storage of your recorded video content. The built-in diagnostic features of this network storage manager let you quickly diagnose an error condition and take preventive measures. With temperature sensors throughout the chassis, you can detect possible air-flow obstruction or clogged intake filters. Front panel buttons allow quick access to the hard drives and the CompactFlash cards for maintenance operations. Moreover, a unique rail system allows you to effortlessly replace a worn out or faulty fan. The use of enterprise-class SAS technology in this Network Storage Manager offers advanced enclosure management and monitoring capabilities. 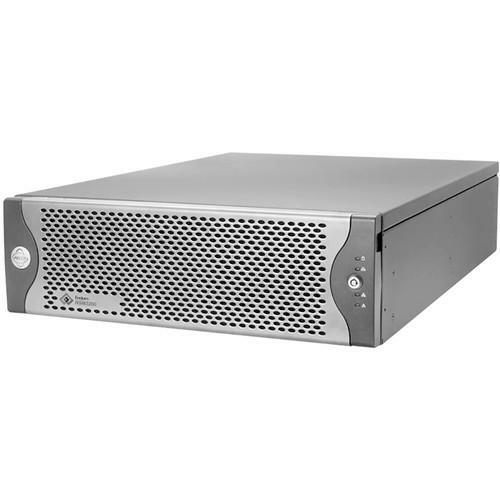 Packed into a fully integrated chassis, the NSM5200 Network Storage Manager is capable of simultaneously handling all other common disk and RAID functions efficiently. The use of low-power components and adaptive cooling technology that manages power dissipation based on load requirements makes it highly energy efficient unit. If you own a Pelco network video recorders (nvrs) and have a user manual in electronic form, you can upload it to this website using the link on the right side of the screen. The temperature at the unit air intake can be significantly higher than room temperature. Make sure the temperature at the air intake of the unit is within the operating temperature range. The user manual for the Pelco NSM5200 Network Storage Manager NSM520036EU can be downloaded in .pdf format if it did not come with your new network video recorders (nvrs), although the seller is required to supply one. It is also quite common that customers throw out the user manual with the box, or put the CD away somewhere and then can’t find it. That’s why we and other Pelco users keep a unique electronic library for Pelco network video recorders (nvrs)s, where you can use our link to download the user manual for the Pelco NSM5200 Network Storage Manager NSM520036EU. The user manual lists all of the functions of the Pelco NSM5200 Network Storage Manager NSM520036EU, all the basic and advanced features and tells you how to use the network video recorders (nvrs). The manual also provides troubleshooting for common problems. Even greater detail is provided by the service manual, which is not typically shipped with the product, but which can often be downloaded from Pelco service. If you want to help expand our database, you can upload a link to this website to download a user manual or service manual, ideally in .pdf format. These pages are created by you – users of the Pelco NSM5200 Network Storage Manager NSM520036EU. User manuals are also available on the Pelco website under Surveillance - Surveillance Video - Network Video Recorders (NVRs).